Do you want your students to learn vocabulary with a board game? Fun learning about Thanksgiving? Yes, it´s possible! Let your students learn while they´re having fun! New and funny opportunities for Language and (bi)literacy development!!! ¿Por qué usar el Parchís? ✓ Favorecen el aprendizaje del vocabulario de Acción de Gracias en español. ✓ ¡Es un juego! A los estudiantes les encanta jugar, por lo tanto, la motivación y las ganas por aprender están aseguradas. ¿Cómo usar el juego del Parchís? ✓ Se asignará un color a cada estudiante. No se recomienda que haya más de cuatro estudiantes, ya que la espera en turnos puede ser muy larga. Lo ideal sería trabajar en parejas. ✓ Esta actividad-juego puede ser un complemento de los centros de aprendizaje como en la biblioteca, centro de palabras y escritura. ✓ Use este juego y otros similares con la pared de palabras (las tarjetas de la pared o muro de palabras se venden por separado, visiten mi perfil Literacy2Reading) a diario para practicar sonidos, letras y vocabulario. 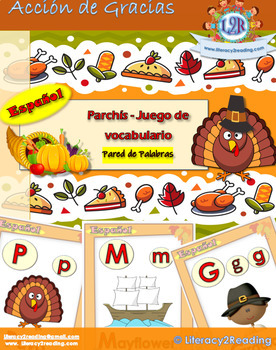 ✓ Encourages the learning of Thanksgiving vocabulary in Spanish. ✓ It's a game! Students love playing while learning. 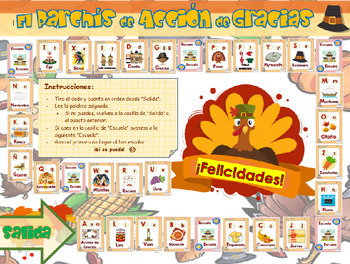 How to use the Thanksgiving ABC boardgame? ✓ A color will be assigned to each student. It is not recommended for more than four students at the same time, since the wait can be very long. The ideal would be to work in pairs. ✓ This activity-game can be a complement to literacy centers/workstations such as in the library, ABC center and writing workstations. ✓ Use this game and other similars with the word wall daily (cards are not included, please visit my profile and products) to improve their Language skills and academic performance. 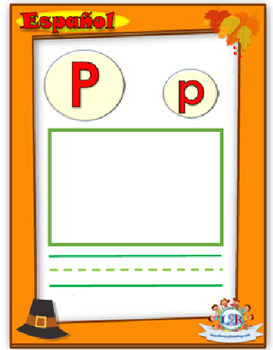 ✓ Can be additional resources and materials to you small group and will help you with differentation in instruction. More Thanksgiving activities by Literacy2Reading? or perhaps the English versión?